When Oklahoma’s $6.8 billion spending plan was unveiled in late May, it was greeted with a mixture of sharp criticism over its cuts and revenue patches and, in some sectors, relief that the reductions were not more severe. From all sides, however, there was one common reaction to the 114-page budget bill: surprise. Final Budget: Who Took the Biggest Hits? Nearly four months after the legislative session had opened, no one knew for certain what the final plan would look like until the waning days. As in past years, a secretive budget process had left most Oklahomans in the dark. Leaders and opinion writers on the left and right condemned the lack of transparency, saying it undermines public confidence. Open-government advocates report Oklahoma is not alone in developing spending plans largely behind closed doors. But they say the state’s budget process ranks among the least transparent in the country. On the final Tuesday of the legislative session, top lawmakers emerged from the Senate Assembly Room with news that the long-awaited budget deal had been reached. With a looming, constitutionally set mandate that the session conclude by the end of the week, the spending measure was quickly expedited. It passed the Senate in less than 24 hours. It then went on to narrowly pass the House with just a few hours before the 5 p.m. Friday adjournment deadline. The 11th-hour release had presented lawmakers with a tough decision: Support the plan as written – since amendments were not allowed – or force a special session that would cost taxpayers tens of thousands of dollars a day. House Appropriations and Budget Chairman Earl Sears, R-Bartlesville, said it was never his plan to roll out the budget deal during the final week. He said the delay was caused by difficulties in getting legislators to agree on various proposals to raise revenue in order to bridge the state’s $1.3 billion gap. He added that negotiators with the Senate, House and governor’s office had to meet frequently before and throughout the session to work out a deal. The negotiating team, which usually included 10 to 12 people, met every Tuesday, and then also began meeting every Thursday as the session progressed. Sears described the talks as “intense” and said funding for the Oklahoma Health Care Authority, for example, could shift by tens of millions of dollars from one meeting to another. Discussions and updates from those meetings were then shared in regular House and Senate Republican caucus meetings. Sears said several dozen lawmakers from the House caucus would typically show up at the meetings. All of these meetings, however, were closed to the public, the news media and Democratic lawmakers. 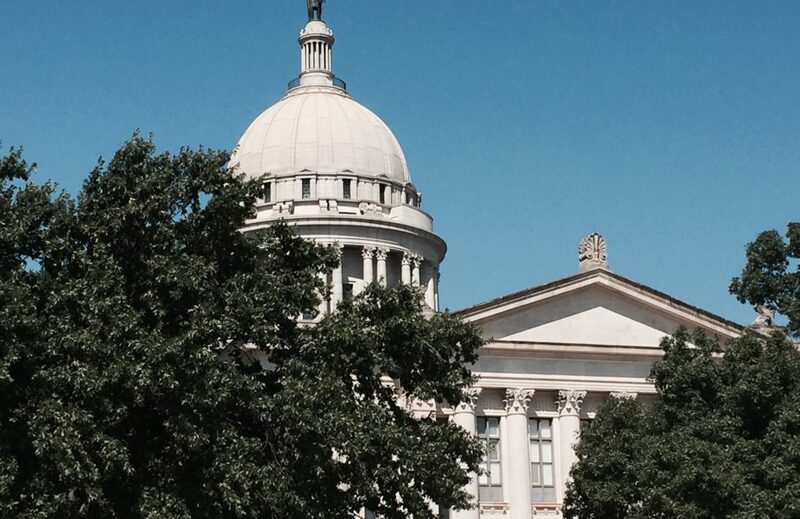 Senate President Pro Tem Brian Bingman, R-Sapulpa, agreed with Sears that this was one of the most transparent sessions for “those inside the Legislature.” While he’s open to making the process more public, he warned that this could kill a potential budget deal. Bingman said state agency heads could also disrupt a deal if they believe their department is being underfunded. The Center for Public Integrity, a nonpartisan group based in Washington, D.C., grades each state yearly on various open-government and transparency measures. In its latest report in November, it ranked Oklahoma fifth last in having a transparent budget process. The center credited Oklahoma for providing the public with ample revenue and spending information before and after the budget is created. But the group faulted the Legislature for its secretive budget work and lack of public budget hearings. These committee-led budget hearings, also called “performance reviews,” are held near the start of the session. The meetings are open to the public, and Sears said he wouldn’t have a problem if someone wanted to speak at a hearing that he led. But Sears acknowledged there is no formal way for citizens to weigh in on the budget. Instead, Sears and other lawmakers often hear directly from their constituents or Democratic lawmakers about their thoughts and concerns on the budget. “That is how it’s communicated,” he said. Shaw, of the Sunlight Foundation, said it’s hard to offer specific advice on budget transparency because every legislature has a different budget structure and rules or laws to follow. But Oklahoma and other low-transparency states can look for ideas in states with a more open process. “You can look towards those states and say, ‘Hey, look, the sky is not falling after they started providing more access,’” Shaw said. Nebraska, for example, ranked the highest in the Center for Public Integrity’s evaluation. That state requires a public hearing for all legislation, including the budget bill. Unlike Oklahoma, Nebraska sets a deadline for when its budget must be filed. If the legislation is not placed on general file by the 70th day of its 90-day session, the governor’s proposal will be used. Renee Fry, executive director of OpenSky Policy Institute, a nonpartisan think tank focusing on Nebraska issues, said such policies have helped encourage public discussion of the budget before it’s approved. “I think it makes the budget more of a living document because you get much more of a feeling of how it will affect real people,” she said. New legislative rules don’t always solve the problem, however. In 2003, Oklahoma passed the “Fund Education First initiative,” a requirement that state’s education budget reach the governor by April 1. But the rule didn’t include any penalties. So in almost every year since, including this year, the Legislature failed to meet the deadline. Sears said this year it was impossible to do so because of the revenue uncertainties, but shortly after April 1, lawmakers provided assurances that common education funding would not be cut by more than 5 percent. Meanwhile, he said he is willing to consider additional legislative moves to improve the budget process, but said he has no plans to push for changes.